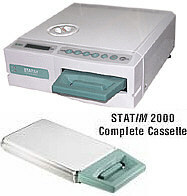 The Statim 2000 is a reliable cassette sterilizer that is compact enough to fit in patient treatment areas and fast enough to sterilize expensive Lasik, PRK, endoscopic and cataract instruments, including phaco handpieces, between procedures - it can complete an unwrapped sterilization cycle in just six minutes and a wrapped cycle in 14 minutes. The Statim 2000 is fully automatic. Simply select one of the three sterilization programs and with a single touch of the keypad, begin the cycle. An advanced microprocessor controls all functions and maintains optimal sterilization conditions, from start to finish. VistaPure’s patented AutoFill accessories replenish SciCan STATIM® and BRAVO™ autoclaves with distilled-quality water automatically — enabling truly hands-free convenience. An efficient, reliable and maintenance free solution to fill your STATIM and Bravo autoclaves with distilled quality water – enabling hands-free convenience without the need to purchase and store distilled water. A 12-foot length of clear polyurethane tubing is already attached to the AutoFill manifold. If the desired distance between the connection to the VistaPure and the autoclave is greater than 12 feet, simply order a longer length of the clear polyurethane tubing, as the distance from the VistaPure to the autoclave is not limited, except by the feed tubing. The VistaPure AutoFill for STATIM device (S3020) can be installed on any new or older model 2000 or 5000 STATIM autoclave.